Click on this item to view, download or print a copy of our latest application form to join the club. Click on this item to view our latest policy. CYBC is a sociable Bridge Club that aims to facilitate relaxed and friendly bridge sessions for people of varying ability. The Club welcomes new members and provides learning opportunity for improvers’ and the more experienced player. New members and visitors are welcomed. The Club meets on Tuesday and Thursday mornings in Yarnton Village Hall, The Paddocks, Yarnton, OX5 1TE. The Hall is fully accessible with car parking provided on site. Coffee, tea and biscuits are available from 9.40am. We like to start play at 10am promptly, the sessions end at 12.00 - 12.15pm approximately. We aim to play 18 boards of ‘Duplicate Bridge’ on a Tuesday morning but this is dependent on number of members attending. 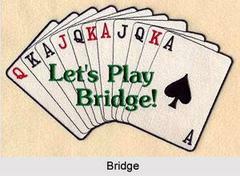 Duplicate Bridge is facilitated on both Tuesday and Thursday mornings. Thursday morning sessions are less formal and played at a slower pace. Dependent on number of members attending 8 to 12 tables of Duplicate Bridge is facilitated on Tuesday and Thursday mornings. This group likes to play ‘Duplicate Bridge’ at its’ own pace, and to review the hands at the end of each board. Boards are computer dealt, and information on possible outcomes readily available for comparison! The sitting still table group can also facilitate play for those returning to playing bridge or have sufficient grasp of the game to play but are not yet confident to play competitively. An ongoing programme of teaching to improve specific skills, aimed at both competent and the more experienced player takes place on a Tuesday morning. Sessions are led by Nigel Wilkes. The teaching table is managed alongside ‘playing tables’. Charge includes coffee, tea and biscuits. The Club relies on members volunteering to set up the sessions and help with clearing up afterwards. The Club is committed to enabling as many people as possible to learn and enjoy playing bridge. However, due to numbers now attending the Club on a Tuesday morning we are unable to offer a programme for absolute beginners. There are a small number of local tutors who organise courses. Several members of the Club have attended courses led by Francis Pike, in Cassington. To read all our latest news....see them listed on the left menu under 'News Page'. Welcome to Central Yarnton BC. We are a friendly club based at Yarnton Village Hall. See the map below and our location page for directions. This web site has been created to give information about session dates and times, results of sessions, club news, lessons and more! We have members from all over the Oxfordshire region and always welcome new faces! If you are interested in joining, please get in touch and we look forward to welcoming you soon. Click to see our 'How to Find Us' page with Google Maps for more detail and street view. Results now on line. Please see our results page for detals.